Children's Day Celebration for Grade 1-10 - 14th Nov 2016. 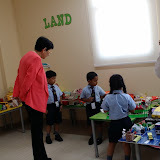 Teachers' day Celebration by KG 1 & 2. Students of Grades 6 to 10 witnessed a Handwriting Competition where they had a choice of language to select from. 209 students of Grades 6 to 10 participated in the competition. It was a pleasure to see beautiful pages being written in Arabic, Hindi, French and English. Arabic Reading Week brought in linguistic enrichment, as there were exchange of ideas within students and staff. Decorative reading corners, interesting activities in the library and classroom enhanced the liveliness of Mayoor Campus. Students of Grades 7 and 8 witnessed experiential learning on 2nd and 3rd May as they participated in the various workshops organized at the Cyber Quest Festival which was organised by NESA(UAE National Electronic Security Authority). A Teddy Bear Picnic was held on 18th and 19th April, 2016 for KG2 and KG1 respectively. The students were excited about the event and happy to bring their own soft toy teddies. The event was filled with fun and excitement with the KG2 students introducing their teddies and carrying them for an outdoor picnic. KG1 students had a little role play by some of the teachers and then danced to teddy songs along with their cuddly teddy friends. The events ended with the students watching a short video and finally coloring teddy bear activity sheets which they happily took home. This was an amazing , fun-filled start to the new academic year. All students celebrated World Earth Day on Thursday, 21st April 2016. On this occasion, students donated plants to school as they passed the message of the importance of Planting trees. During the special assembly, the Eco club members presented the Journey of Mayoor and SSI. Students of higher grades passed the message ‘Trees 4 Earth’ through the badges that were made and distributed to the staff. An Inter house Poster Making competition was also held, where in students painted their thoughts on nature conservation. Students from Primary section showed their creativity and caring attitude towards the planet Earth through the posters they made on the themes - ‘Celebrating Planet Earth’ and ‘Proud to be an Earthling’. Kindergarten students witnessed a tree plantation drive.